Canterbury. I immediately associate so many things with this place in England, though I don’t know much about any of them: the Canterbury Tales, Chaucer’s masterpiece of English literature written in the vernacular; the Via Francigena, which starts in Canterbury and ends in Rome, passing through so many places I know well here in Tuscany; and the Archbishop of Canterbury, who you hear about every time there is a Coronation. 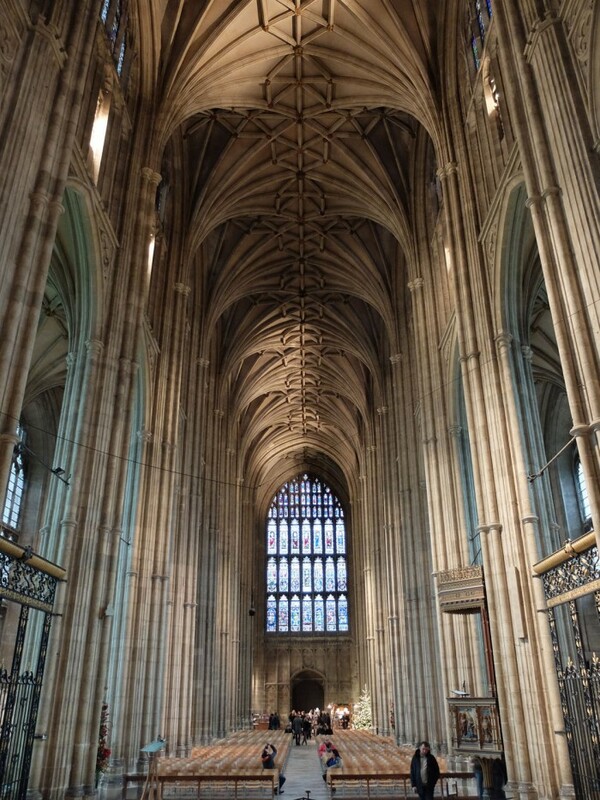 So on a recent visit to London, I booked a private tour with my favourite company, Context Travel: Trail of the Archbishop: Roman and Medieval Canterbury. 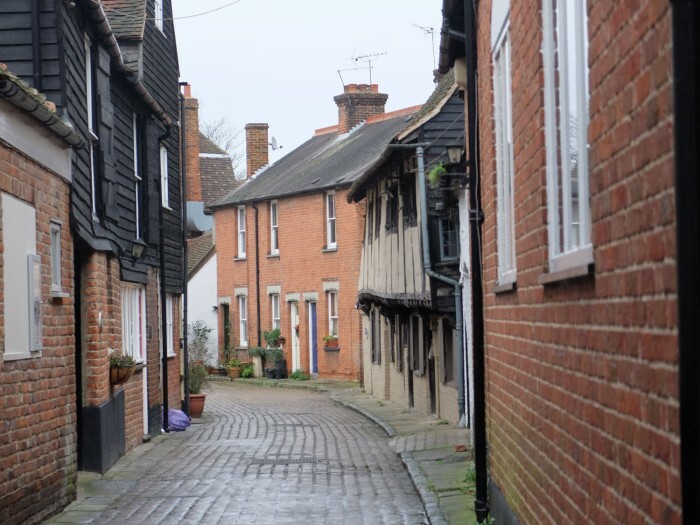 We found it to be a very quaint town, with wonderful architecture and cute shops, and enough to see beyond the Cathedral itself – that I’d probably have missed if I’d gone alone – to make it a great day trip from London. We arrived and met our Context Travel guide, Paul, during a pause between rain storms, so took advantage of the “good weather” to see everything the city has to offer beyond the Cathedral. Learning a bit about the history of Canterbury is probably a good place to start: Paul pointed out that the town is really very close to France and Belgium, and this impacted its development very much. 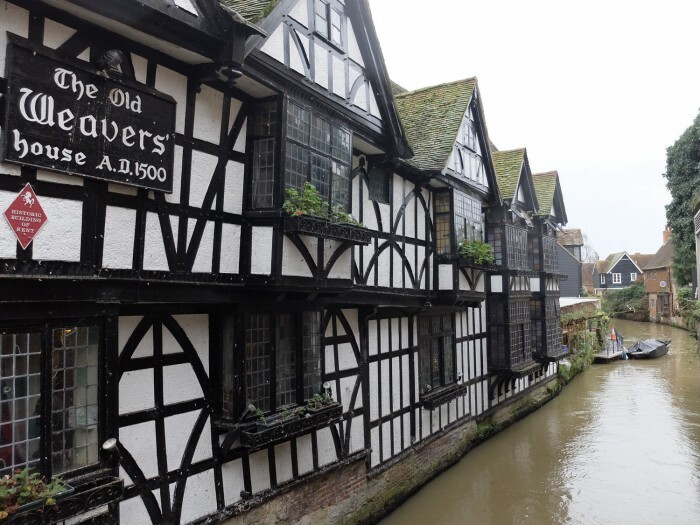 Today, a ferry takes you from Calais to Dover in 1.5 hours, and there are organized day trips to Canterbury that attract numerous tourists from that area. The proximity to France in the 16th century brought Huguenot (French Protestant) settlers, and Walloons from Holland and Belgium, who were welcomed by the city as a way to boost their failing economy. They were, in fact, exceptional weavers, and you can see some of their homes still today, with large rows of windows that served to work by natural light. But even before the 16th century, the French strongly influenced the city: the Gothic Cathedral adapts French style to English taste, and was built by French stonemasons. But the need for a Cathedral at all is due to another foreign import, this time from Italy: Saint Augustine was sent here by the pope in 597. He was allowed in because the King at the time, Ethelbert, had a Catholic wife, Bertha, and so he was allowed to set up a missionary. The monastery that Augustine founded educated Catholics until Henry VIII took it over in 1541, calling it the King’s School. Now it’s one of the most prestigious prep schools in England, still on the same location as in the 6th century, thus making it likely the oldest school in the country. Speaking of schools, an aside: Canterbury is a university town, home to the University of Kent as well as three smaller universities, so its population swells when term is in session. This might be one reason why it’s also a used bookstore heaven – though another factor could be that this was the birthplace of playwright Christopher Marlowe… Worth a visit is the leaning building that houses the Catching Lives charity bookshop (plenty here for £2, and it all goes to the homeless, including a wonderful literacy program). 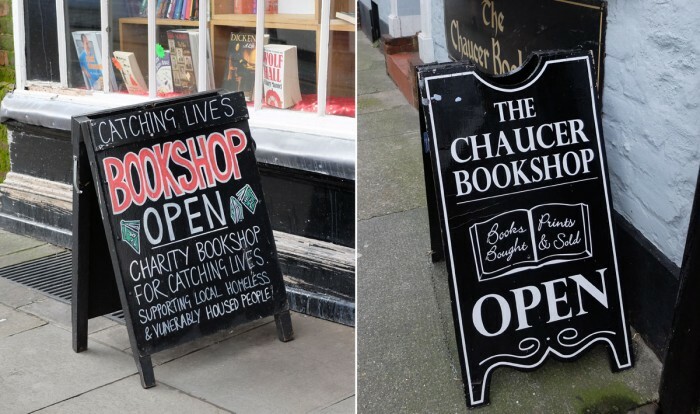 The Crooked House now is a charity bookshop! 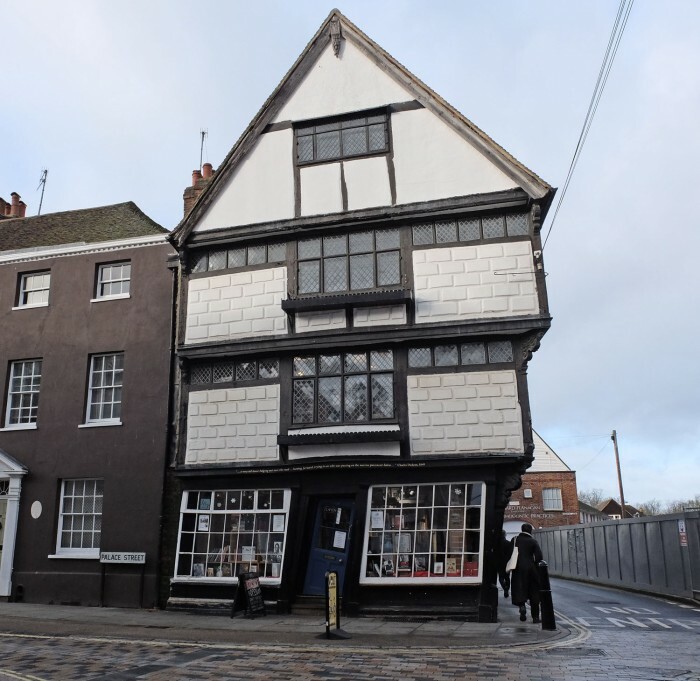 The so-called Crooked House has been crooked pretty much since it was built in the 17th century. For something a little bit more refined, check out the Chaucer Bookshop‘s collection of rare first editions, as well as new and used books. Ready to access a secret garden? A quirky remnant of another foreign import, that of Saint Francis, was a highlight of our visit. 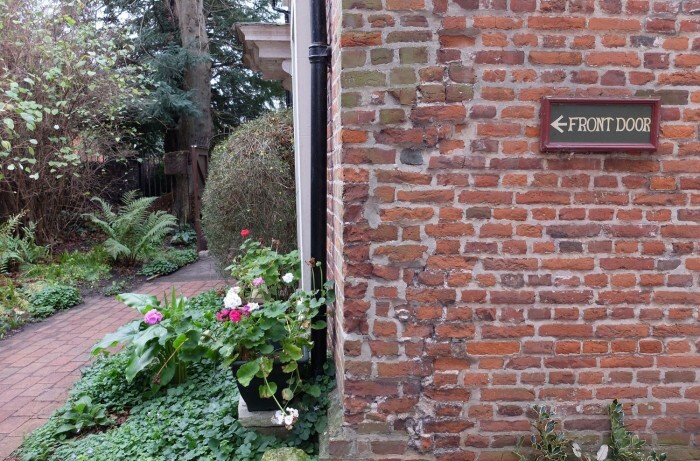 Greyfriars’ Chapel dates to 1267 and is the only remaining part of a Franciscan friary on this property. 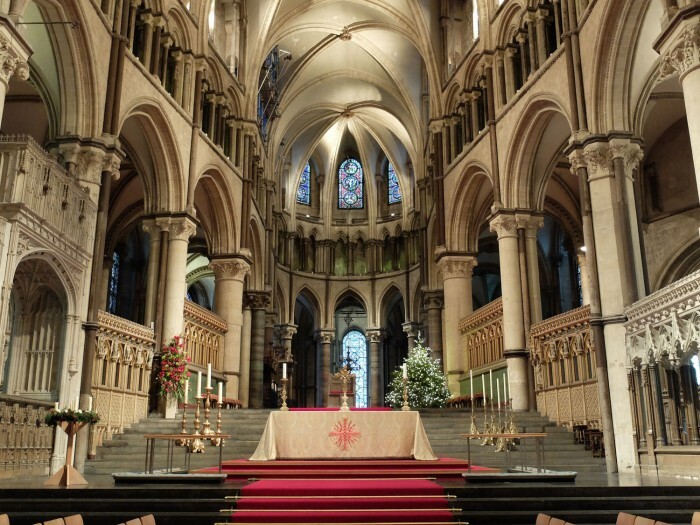 Francis himself didn’t come to Canterbury, but members of the order close to him did. 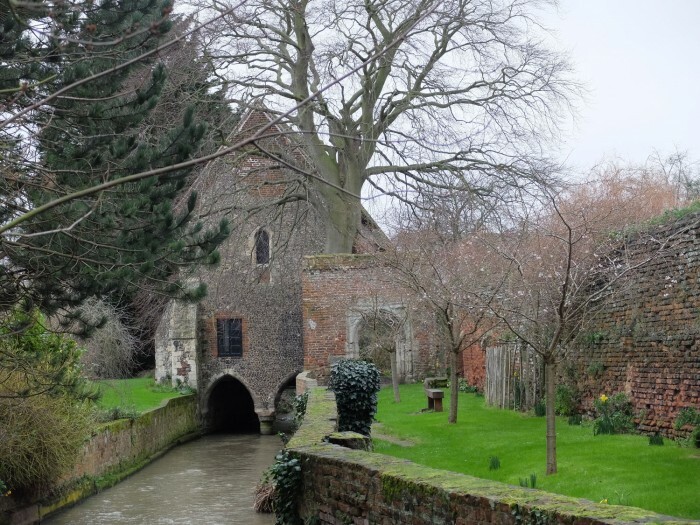 The building that bridges the Stour river probably wasn’t a chapel to start with – though historians don’t know what it was. It survived later Anglican purging, and the 1538 disbanding of the monastery by Henry VIII, probably due to its utility as a bridge! Members of the Franciscan order returned to this place only in 2003. The surrounding English garden and chapel are accessible in the summer months, on weekday afternoons, but Paul was able to get us in when it was closed through the Franciscans’ private garden, making this a little adventure to seek out a very odd building. 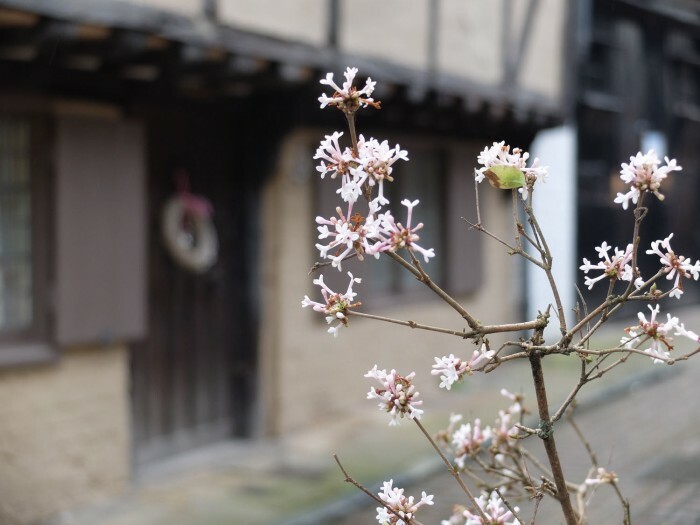 Despite all this talk of influence from abroad, the town of Canterbury is very much the image of the perfect English town, with lots of adorable wattle and daub constructions. 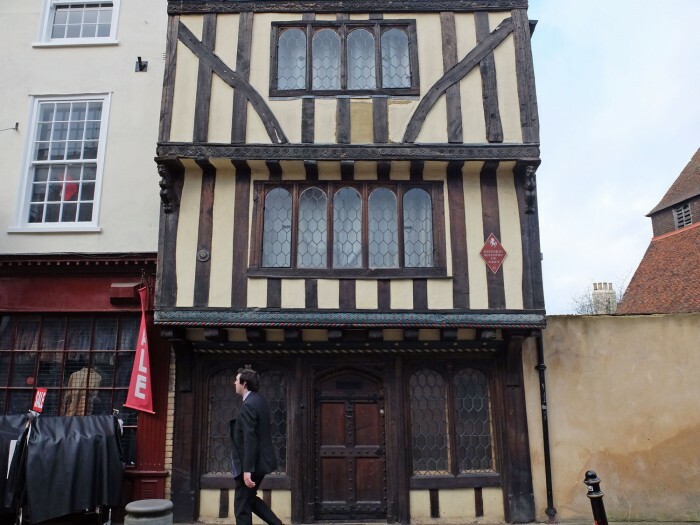 These timber framed constructions were the style typical of England and Wales from the 12th century through to the 18th in some areas, and were a low-cost solution in areas that did not have much native stone (as was the case here). The “daub” part was made of soil, dung, water and chopped straw, packed into the spaces between a wooden structure, and eventually plastered over. More prestigious buildings in this town were made of the local stone, called flint, which was shiny and black and set into mortar. More fine stones, like the limestone used for the cathedral, had to be imported from France. Finally we made it to the Cathedral itself. 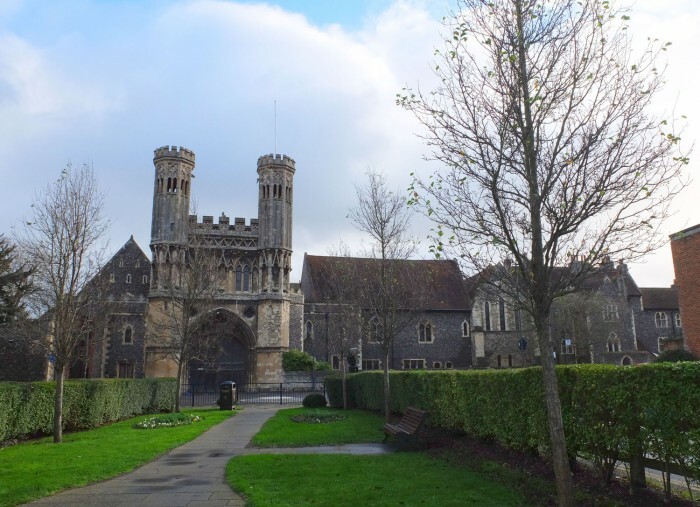 The building we now see is a Gothic one, with the nave and cloister dating to the last three decades of the 14th century and the tower dating to 1497, but the crypt is an earlier Romanesque structure built under Archbishop Lanfranc (1070-89). For a precise and amusing timeline of the various parts of the building, I recommend this awesome article. The oldest Catholic church in England by far, the place got a major boost when the Archbishop, Thomas Becket, was murdered inside the Cathedral by King Henry II’s men in 1170. Money flowed in from the resulting pilgrimage. 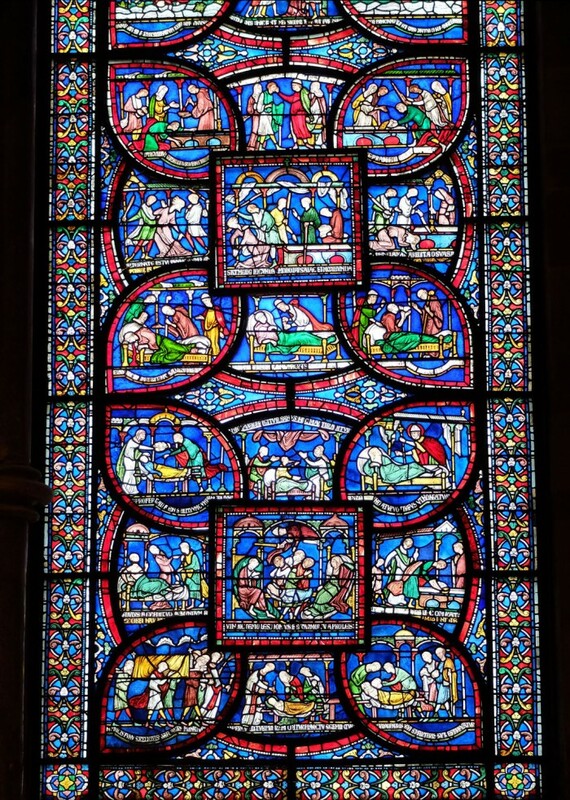 This building is full of stories told around interesting burial monuments and using stained glass narratives. I highly recommend visiting with a guide like Paul, but also talking to the often elderly Cathedral Guides who roam around just waiting to answer your questions (sit down, it could get lengthy). For now, I’ll just let some of my photos speak for themselves. From London St. Pancras station there are hourly fast trains that stop at Canterbury West station (don’t bother with the slower local trains). The off-peak return tickets cost £29 per person, so make sure you book these and not a more expensive variety. Travel time is just under one hour. The train station is conveniently located just outside the city walls. Want to take this tour? 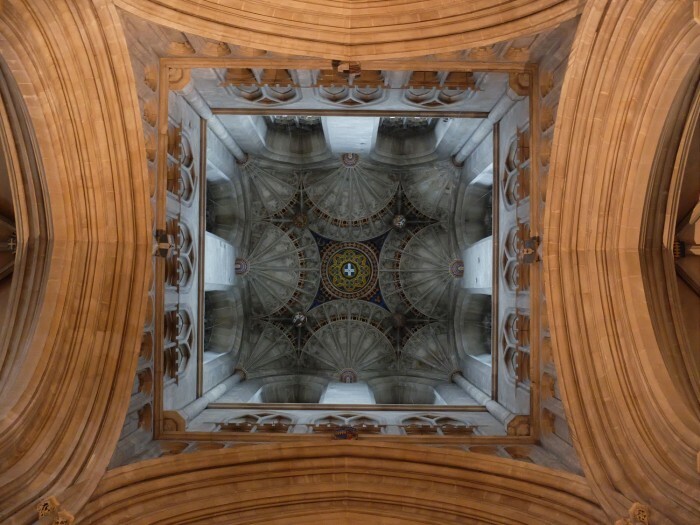 Here’s that link again: Context Travel: Trail of the Archbishop: Roman and Medieval Canterbury. Disclaimer: I am a Context Travel Ambassador: we have a working relationship based on our mutual love of “Deep Travel” – the idea that informed locals meet up with interested travelers to gain more profound knowledge of place.